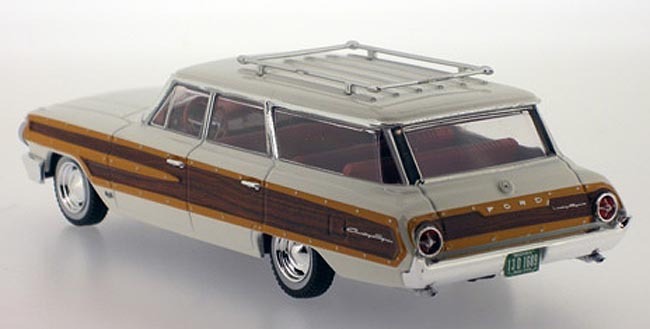 Now IXO, long known for its excellent racing models from F1 to LeMans racers, plunges into the American car market with its PremiumX lineup that includes a 1964 Country Squire, along with a variety of other someone obscure models. 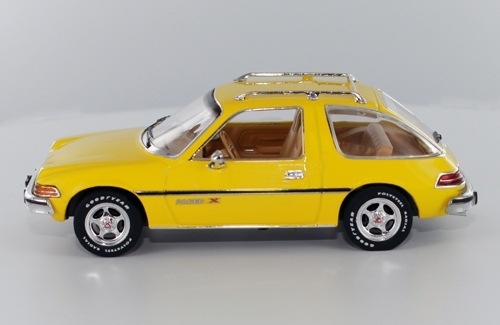 For instance, I also received a yellow 1975 AMC Pacer X for review, and there are few cars as odd as the Pacer. Here’s what I like, beyond the uniqueness of these two non-enthusiast type cars. 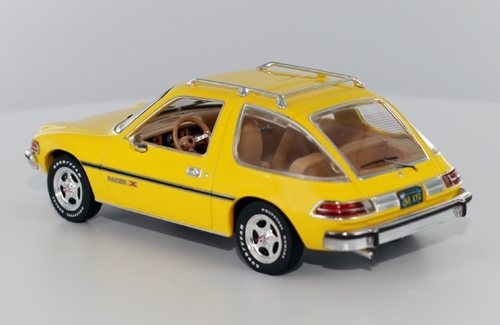 The cream-colored Squire (light blue also is available) is nicely proportioned with realistic looking headlights and round jet afterburner taillights. The bumpers are chromed, as are the door handles, grille, roof rack and the delicate looking windshield wipers and all the window trim from stem to stern. But the fake wood paneling looks great on both sides and the tailgate, with the slightly dimpled look of rivets holding it on. There’s a green ’64 Georgia “Peach State” license plate too, front and rear. The model features raised windows all the way around, so if you display this out of its acrylic case, no dust will get inside on the red plastic interior. The interior includes the third row seat and a well in back where the seat would fold flat. Sounds like a crossover or SUV these days, doesn’t it? While you can’t see the dash perfectly due to the windows, you can see well enough to make out gauges and a three-spoke steering wheel with chrome hub and spokes, plus chrome column shifter and turn signal lever. Sticking out back are two tailpipes with mufflers and the car features white-sidewall tires that are not branded. Oddly there are no external chrome mirrors on the Ford. Nothing opens, but at this price point you wouldn’t expect that. The Pacer has branded tires and a nice looking interior. The Pacer is a little flashier, just because of its bright yellow paint job, but similarly has chrome bumpers (with rubber guards), a small roof rack, mirrors, fancy five-spoke wheels and chrome trim around the windows, and remember, this is a car with major window surface, so much so that folks called it the rolling aquarium.There’s a Pacer X decal on each door, below the door trim strip and good looking tail and square headlights. You also can see the lines in the rear window for the defroster and in front the air vents atop the dash. The driver’s side window is open so you can peek in at the tan interior with its ’70s look three-spoke wheel, and yes, you can see a bit of gauge detail. Tires are branded Goodyear and labeled polyester radials, giving this a realistic overall appearance. Other vintage U.S. car models from PremiumX include a 1971 Buick Riviera, 1977 Cadillac Deville, 1980 Cadillac Seville, 1989 Ford Bronco II, 1972 Ford Torino Sport, 1974 Ford Maverick GT and 1989 Jeep Grand Wagoneer. PremiumX also offers some modern U.S. muscle cars. IXO models are available at finer hobby stores nationwide and online at http://www.replicarz.com.